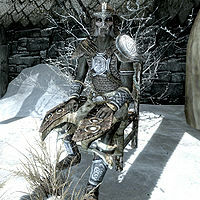 Chief Mauhulakh is an Orc warrior and Chieftain of Narzulbur, the Orc stronghold of Eastmarch. His stronghold runs the Gloombound Mine, which is rich in ebony ore.
Mauhulakh can be found sitting outside his longhouse from 7am to 7pm, when he goes inside to eat with his family until midnight. He spends his days wondering why the gods are angry with him. As an Orc chieftain he should have multiple wives, but he has none. "The blessings of the mine have been many, but I have no mate to share them." Every wife he has taken has died soon after, several during childbirth, including the mothers of his son, Dushnamub, and daughter, Urog. Four graves can be found, up a hill behind the longhouse. "Been married many times but the gods keep taking them from me." While he waits for a wife worthy of the gods, he is taken care of by his two aunts, Bolar and Yatul, a strange relationship that hasn't gone unnoticed by his son. Although they cannot provide him what he wants, more children. Making him look weak even further is the fact that he had to hire outsiders from another tribe to work in the mine to make up for the lack of native tribesmen. When asked if he has any work needing done, all Mauhulakh has to offer is a fistfight for 100 gold. This page was last modified on 20 March 2013, at 04:38.